Early one morning, a few days ago, I was walking up Sixth Avenue by 21st Street listening to a playlist I made on Spotify. It was a virtual Frankenstein hodgepodge of various playlists I discovered during late night listenings. It was so early in the day; yet, songs from Broken Social Scene, Eric Chenaux, Camera Obscura, Little Dragon and many tracks that live on the edge of my mind helped me recover from an early spin class. Perhaps I hadn’t woken up yet. A moment passed between songs as I walked along the Michael’s storefront (which sadly used to be a giant gorgeous Barnes & Noble). I looked up and noticed in the distance, a flurry of bubbles floating and rising over the street. Hundreds of them. They shone against the reality of the buildings,and floated over the cars until they popped one by one. I didn’t know where they came from. Maybe a street vendor? It didn’t matter. The bubbles seemed to momentarily dance with the silvery toned violins playing in my ears, until their soapy selves exploded and splat into oblivion. I went to The Metropolitan that afternoon and I found myself in front of the painting above – a creation by Thomas Couture, a French artist who painted historical figures and taught other famous artists like Manet and La-Farge. Entitled “Soap Bubbles”, it’s rife with metaphorical content. Bubbles symbolize the transience of life. The books depict education and learning, the laurel above symbolizes achievement. 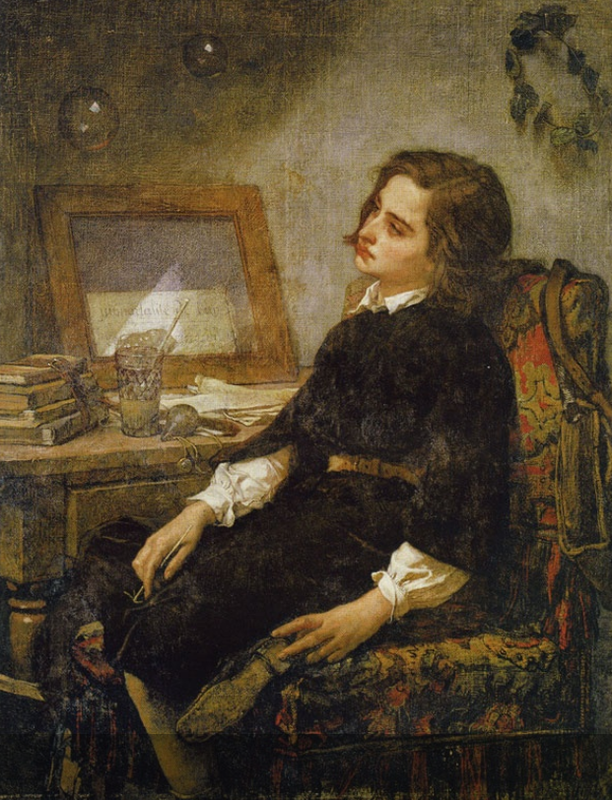 Yet, the boy watches the bubbles, shining against his reality of the room, rise above – like I witnessed earlier that day – until they likely disappeared like moments and time and days and thoughts. So fragile, fleeting and ever changing. It occurred to me later in the day that the flurry of anguish and thought was transient, like a fragile bundle of water, air and soap. There is a time and place for things. There are moments when we are not ready to meet our destiny just yet, or say hello to that person we look at with admiration. Whether that moment ever occurs is not in my hands. I wasn’t ready. One day I will be. I know that moment will come, and when it does – I’ll be ready. I say this to anyone feeling down about lost chances or stuck feelings or blocked creativity. Holding back or losing connection only means we aren’t ready yet. It also means fear has blocked the way. But in my case – in this particular situation – I didn’t feel fear. Something else held me back. A sense that this wasn’t the right time. Feelings are weird. They’re caused by thoughts, and thoughts tend to be nothing. Our thoughts stir up dust until our focus is out of alignment. Like a snow globe, we shake ourselves raw and those flecks of snow obscure our view. Quiet the mind. Life is transient. Use this time to fill up your well so creation comes. Looking back, you’ll see the pattern. You’ll see how everything connected, despite once believing you lost the thread. At least – that’s how I feel. Categories: Uncategorized | Tags: Inspiration, Motivation | Permalink.